Clark Kent is up each morning just seconds before his 6:00 alarm sounds, the chitter of electricity surging to activate the bell reaching his super-ears first. Those super-ears then scan and prioritize distress calls, and the Man of Steel's daily schedule is set in motion. Priority one on this day: a distress call from Laira, Green Lantern of sector 112 - a giant interstellar worm is ravaging the planet Jayd. Elsewhere, Lois Lane meets with Lex Luthor regarding some big announcement Luthor is about to make public. While Superman handles the alien threat on the planet Jayd, Lois endures Luthor's bloviation. Superman's only option for taking care of the worm - a lobotomy - is less than ideal, but will prevent any further violent activity from the otherwise benign animal. Meanwhile, an innocuous announcement from an otherwise malicious animal - Luthor - tickles Lois's funny bone: he's running for the presidency of the United States. Unfortunately, the unaccounted extra time Superman needed to subdue the worm means he's a little late on the scene to the next crisis on his schedule. Bombs burst around the Man of Steel, while Luthor drops one of his own: Lois Lane is going to help him win the election. There you have it. I'm equally as relatable to Superman as I am to Batman. And it still doesn't matter. My point is that the relatable approach that's permeating superhero comic books right now is mostly bunk. We can each find a bunch of things about any character, no matter how far removed we are from the fantasy in which the characters exist, through which we can see a semblance of ourselves. So the active marketing of these characters as being relatable is a business model to make fantasy seem less so. It's a cheap, plastic gimmick, and I ain't buying. Call me goofy, but I kind of like my fantasy fantastic. Nonetheless, like I said, there are details in every character with which we can parallel ourselves. With Superman in this issue it's the waking up early and working out the day's schedule. While none of us are battling galactic threats to aid the Green Lantern Corps, many of us do get up early and work out what needs to be done for the day. That's relatable, and it works very well here. Just the same, I'm sure a good story could begin showing Bruce Wayne getting up and planning out his workload; except, I guess, Bruce gets up at 6:00pm rather than am. I liked seeing Clark gathering himself in the morning, putting his schedule together. While the threat we see him encounter is pretty typical, made to seem fresher with the inclusion of Laira, it acts simply as a way for the plot to navigate towards its focus. Just the same, I'm not fully convinced that the parallel Lois/Lex story compliments what's happening out in sector 112. That will hopefully evolve as parts two and three unfold. Of particular note is just how Lex assumes, or demands, that Lois is going to help him win the presidency of the US. That wasn't a gripping cliffhanger, but it has my attention, and so does Superman showing up late for the next crisis jotted down in his planner. What will be consequences of that? This issue, it seems, pretty much stands as an introduction to the events that are to come. It works well enough to intrigue the reader, but I wonder if there's a point of contention for some when Superman says that the worm is ultimately harmless and that there's no need to kill it. That suggests clearly to me that the Superman in this story isn't opposed to killing if the threat is severe enough. It looks like the red undies don't keep the Man of Steel immune from killing after all. 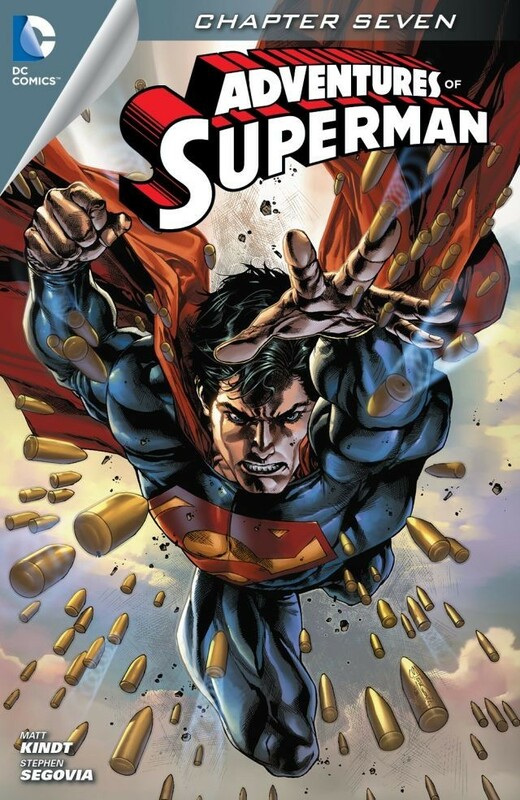 Superman as a killer is buzzing the net these days, and while Superman has killed before in comic books and movies, I wonder why his comments here haven't tripped the radar. Art - 3: The art is mostly nice to look at, with clean lines and slick renderings. I'm particularly fond of Segovia's Lois, but now and again his art seems to meander and go off track. Luthor often looks a shade off here. Cover Art - 4: I like this cover a lot, even though we've seen similar images before.